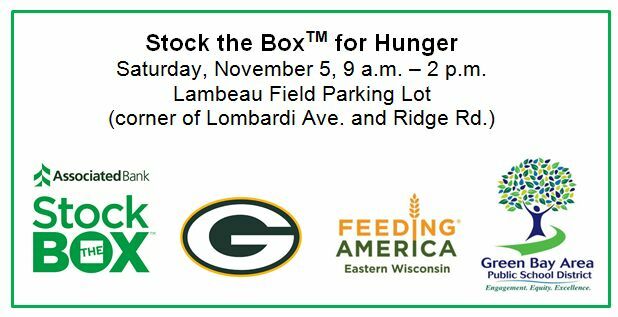 In partnership with Feeding America Eastern Wisconsin, the Green Bay Packers and the Green Bay Area Public School District, Associated Bank will host a community-wide Stock the BoxTM for Hunger food collection. To help with the collection, Green Bay East, West, Preble and Southwest high school bands will be hosting a drive at their respective schools prior to this event. Community members are further encouraged to bring nonperishable, non-glass food items and add to their favorite school’s food collection pile. The school with the largest food collection pile will receive a $2,000 grant to their music department. Runners up will receive a $1,000 grant. Saturday, November 5 from 9 a.m. – 2 p.m.